Captain Allan Hepburn and Second Lieutenant Horace George Eldeon shoot down a Fokker D VII near Seclin, their second victory in two days. Lieutenant (Acting Captain) John Rose begins a period over which he will destroy seven enemy airplanes. Private William Edgar Holmes (Grenadier Guards) carries in two men under most intense fire and while he is attending a third case, he is severely wounded. In spite of this he continues to carry wounded and is shortly afterwards again wounded this time fatally. For his actions this day he will be awarded a posthumous Victoria Cross being killed at age 23. Lieutenant Alfred Hartley (Royal Garrison Artillery) is killed at age 39. He was a cricketer who played for Lancashire. Hartley was a solid, defensive right-handed opening batsman from the West Indies who had a fairly brief career in English county cricket. 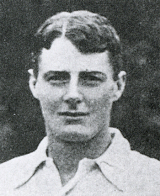 He made his first-class debut in 1907, made 1,000 runs at a respectable average in both 1908 and 1909, but only really came to the fore in 1910 when, with 1,585 runs at an average of nearly 37 runs per innings, he was selected for the Gentlemen v Players matches at The Oval and Lord’s. He did little in the first match, but in the second, though scoring only 24 and 35, he impressed the editor of Wisden sufficiently to be named in the 1911 edition as one of the five Wisden Cricketers of the Year. His big innings of the season was 234 for Lancashire against the very weak Somerset team at Old Trafford, and he also scored a century in the return fixture at Bath. He was born in New Orleans, Louisiana. Lieutenant Lynn Campbell (Royal Air Force) is killed in action with his observer William Hodgkinson. Campbell is a 7-victory ace. Second Lieutenant Arthur John Woodthorpe (Royal Garrison Artillery) is killed at age 37. His brother was killed in October 1915. Second Lieutenant Cyril Lloyd Moubray MC (Royal Engineers) is killed in action at age 24. His brother was killed in July 1918. Second Lieutenant James Bainton Stowell Gell (Royal Field Artillery) is killed at age 19. He is the only son of the High Baliff of Douglas & Castletown Isle of Man. Lance Corporal Wallace Jesse Ward (Royal Engineers) dies in a London hospital from an illness contract in France. His brother was killed in action in July 1917. Private Henry Walter Deverill (Royal Fusiliers) is killed in action at age 23. He is one of three brothers who will lose their lives in the Great War. Private Archibald G Smith (Dublin Fusiliers) is killed by a bomb dropped from an airplane at age 22. His brother was killed in November 1917. Bombardier Alec Andrew Sprudd (Royal Field Artillery) is killed at age 26. His brother was killed in April 1918. Private Albet Warrington (Lincolnshire Regiment) is killed at age 19. His brother was killed last year.